With Death Penalty at Home, Can Indonesia Save Its Citizens Abroad? Jakarta. The government sent a protest note to Saudi Arabia on Monday (19/03), after an Indonesian national was beheaded in Mecca. 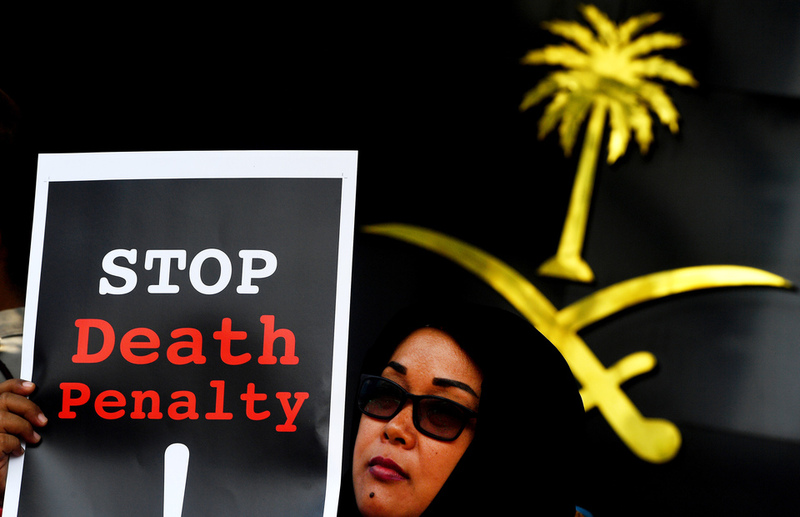 Saudi authorities did not inform Indonesia that its citizen would be executed. Zaini Misrin, a 53-year-old man from Bangkalan in East Java's island of Madura, was a migrant worker convicted of the murder of his Saudi employer. He was executed on Sunday. "The Indonesian government did not receive any notification prior to the execution of Zaini Misrin," citizen protection and legal aid director at the Ministry of Foreign Affairs, Lalu Muhammad Iqbal, said during a press conference in Jakarta. Although the kingdom has has no regulatory obligation to issue such notifications, since the two countries are in friendly relations, Indonesia should have been officially apprised of the decision, he said. With nearly 200 Indonesians facing capital punishment abroad, the government has been making considerable efforts to stay their execution. However, despite huge opposition domestically and on the international stage, and despite its non-permanent seat at the United Nation High Commission of Human Rights, Indonesia itself implements the death penalty. This, in the eyes of many, renders inconclusive the country's attempts to save its own citizens from the cruel and unusual punishment. Since 2011, 583 Indonesians have been sentenced to death abroad. The executions of 392 have been stayed. There are 188 ongoing cases in Malaysia, Saudi Arabia, China and the United Arab Emirates. Most of the cases involve migrant workers, but there are also drug trafficking convicts, especially in Malaysia. Zaini's journey to Saudi Arabia began in 1992, when he started working as a private driver for Abdullah bin Umar as-Sindi. He then came back to Indonesia, and returned to work for the same employer in 1996. Zaini was arrested by Saudi authorities in July 2004, on charges of murdering As-Sindi. He was convicted in November 2008. In accordance with Muslim law, in cases of killing and wounding, Saudi Arabia applies qisas, or the law of retaliation — a person who has injured another is to be penalized to a similar degree, unless he or she is pardoned by the victim's family. Indonesia was granted consular access to Zaini only in 2008. The delay, according to Lalu, was caused by imperfections in the previous protection system for Indonesian citizens abroad. To save Zaini, the government appointed two lawyers in 2011, while presidents Susilo Bambang Yudhoyono and Joko "Jokowi" Widodo requested Saudi Arabia that he be granted clemency. Jokowi raised the issue three times with King Salman bin Abdulaziz. So did Foreign Minister Retno Marsudi during her meetings with the Saudi counterpart, Adel Jubeir. Zaini's family came to Saudi Arabia with a plea for pardon from As-Sindi's family. To no avail. The Indonesian government requested a case review in January 2017. It was rejected. Another appeal was filed in January this year, and the case was stiil ongoing at the time of Zaini's death. "We have summoned the Saudi ambassador to express our disapproval over the execution and the fact that it took place despite the ongoing legal process," Lalu said. According to Jakarta-based Migrant Care, Zaini's testimony reveals he confessed the murder under pressure and intimidation by Saudi authorities. "During his trial, Zaini Misrin had no neutral and impartial translator," the organization said in a statement. Under the principle of qisas, offenders can receive forgiveness from their victim's closest relatives. This in 2017 saved the life of Masamah, another Indonesian migrant worker in Saudi Arabia, who was convicted of murdering her employer's child in 2009. An alternative punishment to qisas is diya or "blood money" — the financial compensation paid to the heirs of a victim. In April 2014, the Indonesian government paid 7 million riyal ($1.9 million) to free Satinah Binti Jumadi Ahmad from death row in Saudi Arabia. Satinah, a domestic helper from Ungaran, Central Java, was convicted of killing her Saudi employer in 2007. She said she acted in self-defense. According to Lalu, in Zaini's case, the victim's family was not willing to exercise its right to pardon or diya. To offer more protection to Indonesian citizens working abroad, the House of Representatives passed a new law in October. The 2017 Law on Migrant Workers replaced the 2004 Law on the Placement and Protection of Indonesian Migrant Workers. It establishes a framework to improve cooperation between the central government and local authorities in the migrants' places of origin, and guarantees more assistance to them, including insurance and competency training. Director general for labor supervision at the Ministry of Manpower and Transmigration, Maruli Apul Hasoloan, said during Monday's conference that all prospective migrant workers will be informed about their rights and mechanisms to protect them, as well as the existing regulations on labor in their receiving countries. The government is now also particularly careful about making sure that Indonesians willing to work abroad have all their documents and permits cleared before they leave. "According to our statistics, 92 percent of the cases against Indonesian migrant workers are related to those who left the country without following the necessary legal procedures," said Hermono, secretary of the National Board for Placement and Protection of Indonesian Overseas Workers (BNP2TKI).